White Rose Foundation | Weiße Rose Stiftung e.V. The objective of the White Rose Foundation membership association is to uphold the memory and legacy of the resistance group The White Rose against National Socialism. With that, we aim to contribute to civic courage and individual responsibility and to promote democratic consciousness. 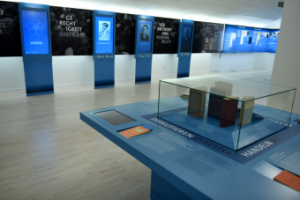 The foundation hosts a permanent exhibition in the ‘DenkStätte Weiße Rose‘ in Munich as well as travelling exhibitions, events and educational historical projects about the White Rose and their resistance against the national socialist dictatorship. It is a special concern of ours to make the White Rose’s legacy meaningful in our day and time. The White Rose is one of the best-known German resistance groups against the national socialist dictatorship. Their thoughts and actions are a symbol of human dignity, freedom, justice, and self-dependent conscientious action. Our permanent exhibition about the history of the White Rose and its resistance in times of Nazi terror and of criminal war. It is complemented by a section about how the White Rose has been remembered since 1943. The White Rose Foundation makes available a travelling exhibition for partner organizations. 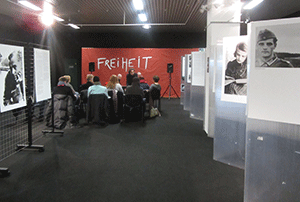 The exhibition panels can be borrowed internationally in various languages. They provide information about the participants in the resistance circle, their actions, and the destruction of the White Rose as well as about life during national socialism. The White Rose Foundation offers seminars for teachers, educational materials as well as guided tours and school projects. These activities are centered around questions such as: How can young people be made aware of the ideals of the White Rose today? What will happen in the era following that of the witnesses to history? Visit our events page for more information on current events and news related to the White Rose.